We first gave bubba the Vtech walker when she was 11 months old. She has always loved the activity centre on it but never really got the whole walking part – she would just push the thing away from her with her feet firmly planted on the ground until she was stuck, her body reaching out like an arch. 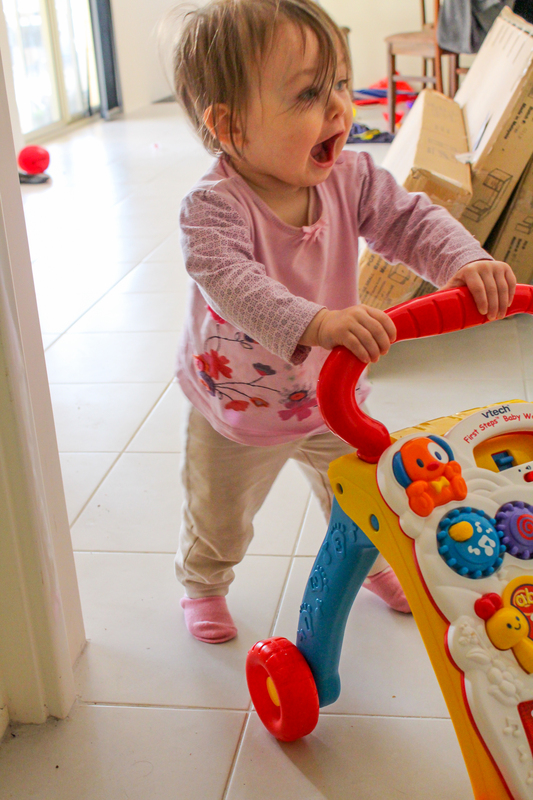 Today I noticed she was pushing one of the kitchen chairs along, so I decided to give her another go pushing the walker. She LOVED it! She laughed and squealed and zoomed along! She needed a little help navigating corners, but she’s definitely figured out the one foot in front of the other part. Bonus photo below – later on she discovered a new obsession… opening up the kitchen side cabinet and playing with the plastic bowls. She makes me laugh! They really do things in their own time, don’t they! You can’t force the little cuties!